The annual Marinette and Oconto County UW-Extension First-Cut Alfalfa Quality Monitoring project monitors alfalfa forage quality changes, allowing farms to make informed decisions about harvest timing. The first set of data was collected on Thursday, May 17 2018 from 8 fields across the two county area and indicated that most dairy farms will be harvesting first crop alfalfa beginning as early as late next week. First crop is usually the most important harvest of the year, and farms use quality data to make sure that they harvest at the appropriate forage quality for their operation. The only way to be sure about harvest timing is to monitor quality in your own fields by using the Predictive Estimated Alfalfa Quality (PEAQ) system, or by following the results of the area-wide monitoring project. Scott Reuss, Crops/Soils Extension Marinette County Agent, will gather quality data from numerous fields across the two-county area through the first full week of June. As mentioned, the first set of data indicated that most fields are one to two weeks away from harvesting to achieve dairy-quality forage of 150 to 180. In-field quality ranged from a low of 215 in a field near Lena to a high of 237 in a field near Oconto. Producers can call the Scissors Clip Hotline 24 hours a day at 715-732-7518 or toll-free at 1-877-884-4408 to get the most current local information. Producers can also log on to the state site and look at data from all cooperators across the state, at http://www.fyi.uwex.edu/scissorsclip/ or can e-mail to scott.reuss@ces.uwex.edu There will also be a link off the local office web pages. 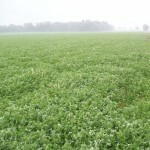 Normally, pure alfalfa fields will drop about four or five Relative Feed Quality (RFQ) points per day. Most weed species, along with forage grass species, have lower RFQ values than do alfalfa and clovers. Thus, fields with high weed or grass content need to be cut sooner than those which are pure legume stands. Each farm must match their harvest timing to their forage quality needs. Farms must also account for harvest and storage quality losses of nearly 10%, meaning they must harvest at 200 to get 180 RFQ feeding quality. Some dairy farms want 185 RFQ point feed, while beef farms may wait to capture more yield and have 125 RFQ point hay/haylage. It is a balancing act for dairy farms in this extremely tight margin year, as fewer cuts means more tons of forage and less harvest cost. However, more cutting events yields higher quality alfalfa and fewer purchased nutrients. If you have questions about forage quality or other agricultural or horticultural concerns, please contact Scott Reuss, Extension Marinette County Crops/Soils Agent, via any of the above means. Alfalfa Quality estimates from fields walked May 17th. More winter damage than I was expecting to see. All fields are late vegetative yet.